As the windows to the soul, your eyes guide you through every stage of life. These valuable tools are often not valued until something goes awry. Once an issue develops, the eyes become a central priority for many people. Eye emergencies are no joke, and should be taken care of immediately to minimize the long-term damages. Signature Optometry is here to help Californians keep a sharp eye on the future with comprehensive optical services. As an experienced optometrist in Fresno, we have the skills and tools needed to provide any and all services related to your ocular health. From intensive eye therapy to fittings for contacts, our eye doctors are here to help bring your world into focus. We are available to treat patients in case of an emergency. Eye problems can be very serious if left unattended. Today, we’ll continue to discuss the causes of common eye emergencies, as well as the value of our responsive and caring services. If it’s been awhile since your last eye exam, you can contact us anytime to schedule an appointment! There are numerous measures in place to protect your eyes from harm, yet accidents do happen. The cause and seriousness of your eye emergency can vary widely, which is why Signature Optometry suggests to be safe rather than sorry. Read below to learn more about a few common causes behind eye emergencies. Any level of impact around your orbital socket can result in eye problems. 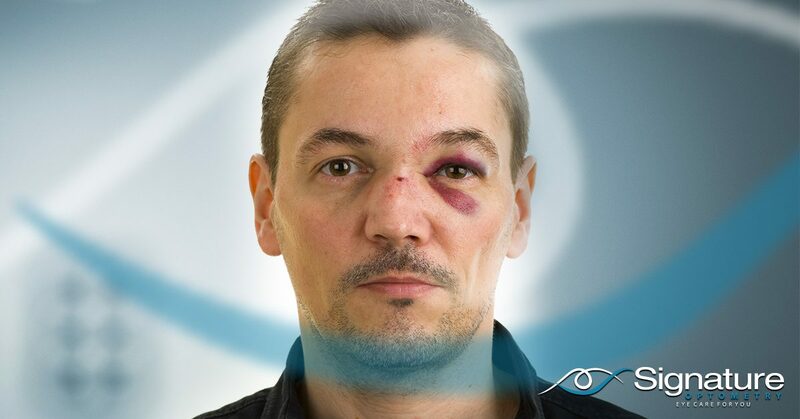 The most common outcome of trauma to the eye area is bruising and swelling, usually referred to as a black eye. If too much swelling occurs, complications can develop from circulation issues. Hyphema, for example, is the occurrence of blood inside the front of the eye, creating serious concern. Trauma can also occur from direct impacts with the eye itself. In these cases, it’s always best to seek immediate medical attention to prevent any further damage. Decreased, blurry vision, headaches, dizziness, or even loss of vision can occur if you are not treated after an incident. We see our fair share of eye injuries resulting from recreational sports such as softball, and we’re here to state that injuries are a serious deal. As resilient as the human eye is, it is no match for the myriad of dangerous substances found in our daily lives. The cause of your chemical contamination can range from work-related exposure to rubbing your eye at home after cleaning the kitchen. In any case, chemical injuries represent a serious emergency. Acids and alkalis alike can wreak havoc on your eye, damaging the conjunctival and scleral vessels in the process. If not treated immediately, extensive damages can occur. Permanent eye damage can be negated with topical anesthetics and extensive washing with a saline solution. The treatment following your emergency visit can vary widely based on the extent of the damages. Burns that are considered grade I or II will generally result in prescribed eye drops and artificial tears to promote proper healing. More extensive damages will require more treatment, such as topical steroids and citrate drops. Our eye therapy in Fresno can help patients who have sustained extensive eye injuries. Small irritations in the eye can quickly turn into an emergency call if left untreated. While many of us try to avoid seeking help when it isn’t necessary, eye complications are a different matter that should be addressed immediately. Regardless of the cause, your eye injury can worsen and cause a litany of further problems. If you are dealing with eye irritation, be sure to schedule an appointment with your doctor or optometrist for fast results. Signature Optometry is proud to be your local optometrist in Fresno, delivering comprehensive eye care to patients every day. It’s important to keep your eyes healthy, which is why we’re so passionate about our practice. If it’s been awhile since your last exam, feel free to contact us today to schedule an appointment!